Day 86 – Call In The Guards. . .
We couldn’t help but notice, and since no one else even bothered to comment, we blew the whistle on ourselves. Yep. Yesterday, we were out of sequence. It happens to the best of folks; when you’ve made the commitment to sample and write about 365 different wines in the same number of days, it was going to happen. We didn’t write a disclaimer before we started, so now is probably as good a time as any to note that, occasionally. . .and we mean occasionally. . . there may be discrepancies in the numbers of days reported compared to the actual number of days reviewed. Through no fault of our own, the “numbering system” gets flawed and we may, inadvertently, skip or duplicate a number–which is EXACTLY what happened last night! So, just to be clear–tonight is Day 86 and tomorrow will be Day 88–it’s all part of the NEW MATH! Any questions? So, the sales totals for the first full weekend of shopping for Christmas is starting to come in and the numbers are pretty impressive. We really wonder how many people actually hit the streets to shop on Black Friday or Saturday or Sunday, or the real number of people who wait until – – – CYBER MONDAY – – – to do their shopping. Since all we’ve heard about today is the amazing number of deals available for cyber-shoppers, we thought that maybe online sales could eclipse in-person sales this year. We saw an estimate this morning that seemed to conclude that today’s sales could exceed $1.5 billion! On the one hand, that is an impressive amount of business–tough to imagine anything but success with those kinds of sales. However, the pie is only so big which means that sales from traditional ‘brick and mortar’ retailers is probably going to suffer. It only stands to reason that if you buy something from Retailer A online instead of buying it from Retailer A’s store in your town, that Retailer A does just fine but the store and the sales tax to the local community – – well, NOT SO MUCH. We wanted to have some fun on a Cyber Monday, so we chose a blend that we bought at Trader Joe’s . . . tonight’s wine is a 2009 Guard Shack from Sonoma County, California. . .it’s a blend from DC FLYNT MW SELECTIONS who specialize in varietal blends from Napa and Sonoma Counties. This particular wine delivers a blend of spice, sweet, rich, black and red notes that range from cassis to wild red berries all deftly supported by the smell of warm earth and tannins. What we immediately noticed was the amazing nose of fruit, smoke and cedar that was parlayed into a taste of all of the above and then some. We were pleasantly surprised by, not only the amazing taste on the palate, but the long beautiful finish. Certainly not what you’d expect from a relatively ‘no-name’ wine available at Trader Joe’s. We like big, inky red wines and this one fills the bill. Just to be sure, we grilled some beef with sauteed mushrooms and red onions along with garlic mashed potatoes. Needless to say, the food and the wine paired exceptionally well together. The hardest part for most wine lovers is to break outside of their ‘box’ – a comfort zone of two or three labels of wine that are just too ‘easy’ to give up (please note, this is not to be confused with BOXED WINE). 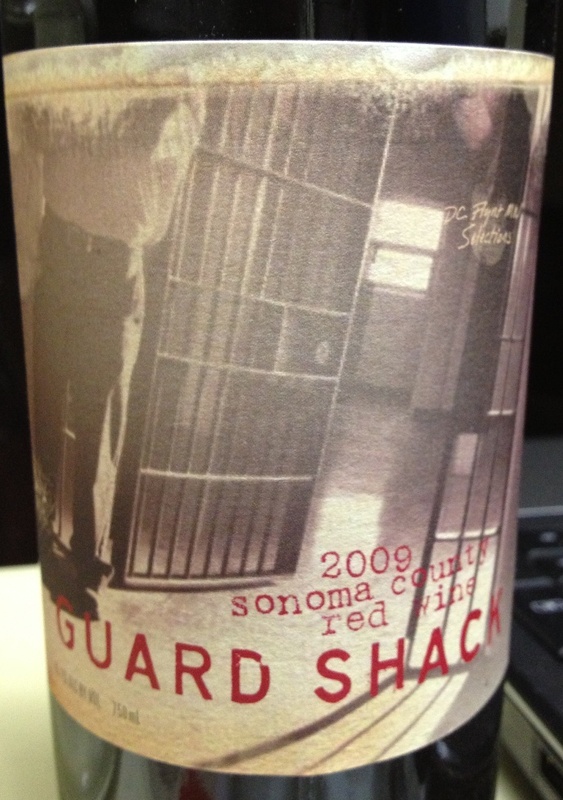 We encourage you to “call in the guards . . .” and try this 2009 Guard Shack. It’s a nice little change of pace from your ‘normal’ varietals and you may just like it. If wine places like, Max’s Wine Dive, has it on their menu, one of two things comes to mind – A). They must like what Guard Shack has to offer in value and taste. . .or. . B). They are looking for a few good suckers to buy something that will make them extra money. The cynics will opt for ‘B’, but the answer is clearly ‘A’ which is your cue to give this wine a taste. And, whether you’re a Cyber Monday freak, geek or sheik . . . the key is to ALWAYS remember that life is too short to enjoy BAD wine. Until tomorrow, remember to enjoy your favorite wine responsibly and recycle whenever possible. Categories: Uncategorized | Tags: Black Friday, brick and mortar, Christmas, cyber shoppers, food, Guard Shack Wine, mortar retailers, Red WQine, restaurants, Sonoma County, traditional brick | Permalink. I would love to try the Guard Shack wine. Which Trader Joe’s did you buy it from? Julie – our bad – we actually picked this wine up at Max’s Wine Dive in San Antonio…Well worth the price! Thank you! I am definitely going to check it out! Yeah, this isn’t available at Trader Joe’s. But it’s a solid wine. I was just in Austin at Max’s and had a great time, including this 2009 Guard Shack. Austin is a fun town, and it seems like there’s a good wine scene there. Cheers! Really glad you enjoyed – and, yes – Max’s Wine Dive is a must see!